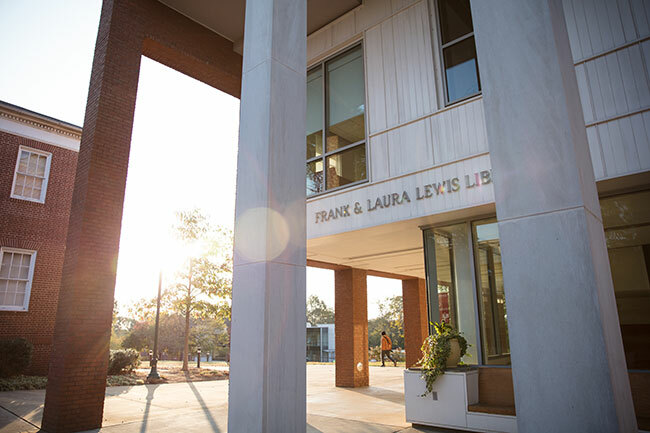 The Frank and Laura Lewis Library opened 10 years ago and quickly became the academic heart of the campus. 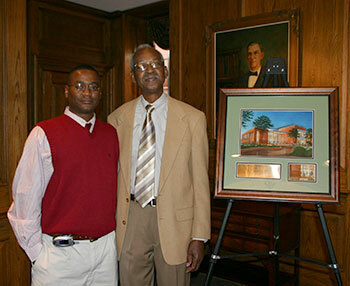 Its significance to the college and community will be celebrated today at an open house from 2 to 4 p.m. at the library. Jason Lewis said having the new library named for his parents was a moving tribute to two wonderful people. Unfortunately, Laura Lewis passed away before the naming of the library project, and Frank Lewis died before the building’s completion. “However, the Frank and Laura Lewis Library ensures that the legacy they put forth will be remembered for many years to come,” he said. Situated at the center of the campus in proximity to the dining hall, dorms and classrooms, the $16.9 million facility includes a coffee shop, 24-hour study area, individual and group study rooms, media lounge and state-of-the-art audio-visual technologies. 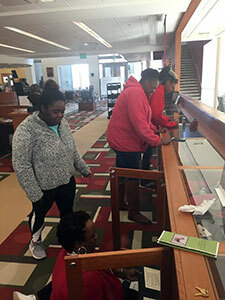 It also has 45,000 square feet of approximately 336,000 print and electronic books, an extensive reference collection, a large DVD and CD collection and about 200 full-text databases for all academic disciplines. Baxter said she is delighted in the growth of library patrons over the last 10 years. Scott Hawkins ’74 was campaign chair for The Defining Moment campaign that raised $65 million for construction of the library, plaza and Gulley Gateway, as well as renovations to Banks and Quillian buildings, Callaway Auditorium, Sunny Gables Alumni House and the football addition to Callaway Education Building. He said he was moved by the generosity of everyone who contributed to the campaign. Jason Lewis said he is looking forward to sharing stories about his parents at today’s event. The Panthers’ eight-game winning streak ended with a 92-78 loss at William Peace last Sunday. Gary Bishop had 16 point for the Panthers (14-5, 10-2 USA South). LaGrange (11-10, 5-7 USA South) ended a three-game losing skid with a 60-39 win at Agnes Scott on Wednesday. Riley Chlupacek led LC with 12 points. The LC swim teams competed in a dual meet at Emory & Henry last Saturday. The men defeated William Peace and lost to host Emory & Henry, while the women took third place. Feb. 1 – Men’s basketball vs. Methodist, Mariotti Gym, 7:30 p.m.
Women’s basketball vs. Berea, Mariotti Gym, 2 p.m.
Men’s basketball vs. Covenant, Mariotti Gym, 6 p.m.
Feb. 3 – Women’s basketball vs. Maryville (Senior Day), Mariotti Gym, 2 p.m.
Feb. 6 – Women’s basketball at Wesleyan, 6 p.m. Dawn Coker, left, Vice President for Human Resources, congratulates Stephanie Marcellini, an accounts payable specialist in the Business Office, for receiving this year’s Staff Stellar Service Award. The honor is given to a regular full-time or part-time staff member who has been employed for at least one year and has been selected by staff and faculty in recognition of that person’s outstanding customer service, commitment to teamwork and demonstrated support of the college’s mission and core values. The nominees were selected by the Academic Council, the Administrative Council and the Staff Council. 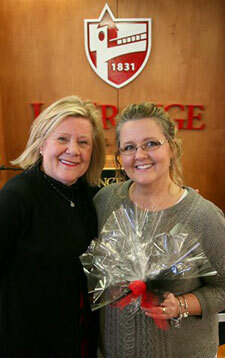 The other two nominees were Laura Faulkner in Spiritual Life and Career Services, and Todd Prater, Registrar’s Office. 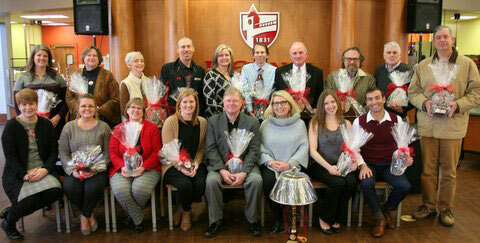 Members of the college’s faculty and staff were recognized Thursday for their years of service. Pictured are, front row, Dr. Gretta Wright Milam, five years; Stephanie Marcellini, Staff Stellar Service Award; Laura Faulkner, 10 years; Angela McSpradden, five years; Lee Davis, 10 years; Dr. Maranah Salter, 35 years; Dr. Stacey Ernstberger, 10 years; Dr. Jon Ernstberger, 10 years; back row, Dr. Lisa Crutchfield, 10 years; Dr. Laine Scott, 20 years; Martha Pirkle, 25 years; Lee Buchanan, five years; Pamela Tremblay, 20 years; Dr. Arthur Robinson, 20 years; Dr. Greg McClanahan, 30 years; Lee Johnson, 30 years; Dr. Charles Kraemer, 40 years; and David Wiggins, 15 years. Not pictured is Lee Richter, 25 years; and Dr. Beth McClanahan, 10 years. Martha “Mrs. 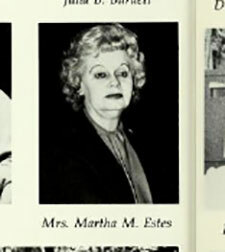 Doc” Estes HA’13, a former Choral Director and Assistant Professor of Music at the college, will be celebrating her 90th birthday on Feb. 12. Her son, Morris, has asked friends and former students to “shower” her with birthday cards. They can be sent to Martha Estes, P.O. Box 1703, Forest City, NC 28043. Student Engagement has planned several activities through Wednesday to celebrate “Welcome Back Week.” A Club and Organizations Fair will be held from 11 a.m. until 1 p.m. today (Friday) on the library plaza; a basketball tailgate will be at 2 p.m. Saturday at Mariotti Gym, featuring raffle prizes during each game and a grand prize during the third game; a Super Bowl party at 6:30 p.m. Sunday in the Spiritual Life Center (food will be provided); Nash Fung: Magician will perform at 8 p.m. Monday in Dickson Assembly Room; and food trucks will be behind Pitts Hall from 11 a.m. until 1 p.m. Wednesday (limited $5 vouchers will be available). For more information, contact Kayla Watson at kwatson1@lagrange.edu.